'The Woeful Second World War tells you the foul facts about the worst war ever - from snow-bound cities under siege and fly-infested jungle trenches to Mrs Higginbotham's house two doors down - nowhere was safe. who made a meal out of maggots? which smelly soldiers were sniffed out by their enemies? why white knickers could kill you? 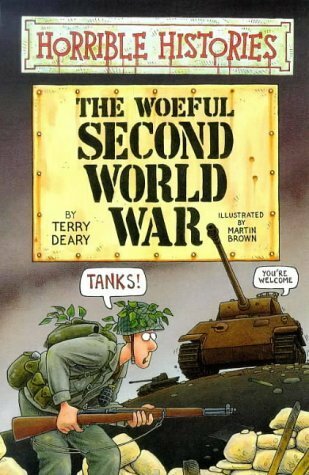 This is part of the Horrible Histories series written by Terry Deary giving an insight into the Second World War. The book is meant for young readers and thus, like any other book in the series, it also illustrated. The book starts with the timeline of the Second World War, going on to talk about the British Home Guards, certain acts of espionage by spies, the actions of the Soviet and German troops and eventually about how animals were used and finally, the holocaust. The book was filled with lots of interesting facts and illustrations on the war (including the cover photo!). The book fulfilled what was expected out of a Horrible Histories novel, giving a broad picture of the war, several interesting facts surrounding it, bringing out the lifestyle of people during the war (with particular focus on children, considering they are the target audience of the book) and finally, also debunking certain myths surrounding the war and the practices of various belligerents, British, Soviets and the Germans alike. What I also particularly liked about the book was also the illustrations and yes, a lot of it were genuinely funny, while actually telling quite a serious event. 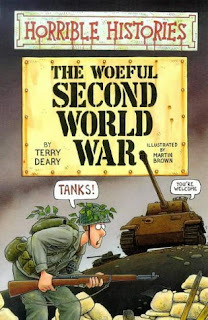 One of the pitfalls of a Horrible Histories book is that the focus on Britain is a little too high, including the book on First World War from Horrible Histories but then, this book managed to go beyond that, covering the British, Germans and the Soviets. However, I felt that at times, the book focused more on certain obscure facts surrounding the war rather than the war itself; after all, the entire timeline was closed out in a matter of two pages. Additionally, I also felt that Japan was barely mentioned, even though they were quite an active belligerent during the war on the eastern front. This book is meant for school children and yes, I read it first when I was in school, back in 2008 and I really loved it back then and whatever shortcomings I am quoting right now are things that I noticed after my second reading, right now. So yeah, considering that, I would award the book a rating of eight on ten.